Saya baru balik dari Dataran Merdeka , Sabtu malam. Allahuakbar..... ramainya manusia.Anggaran saya lebih 20ribu orang. Saya sampai tepat azan Asar dan solat di mesjid jamek KL. Selepas solat kami beramai-ramai menuju ke jalan TAR. Orang semakin ramai. Banyak kenderaan yang lalu dengan membawa gambar Anwar. Risalah Suara Rakyat edisi pertama telah diedarkan. Hampir setiap kenderaan memasang lampu dan membunyikan horn. laungan Reformasi, Allahuakbar, Mahathir Undur, Hidup Anwar dan lain-lain kedengaran dimana-mana. Ramai Polis dan FRU wanita (? FRU lelaki) mengawal orangramai dari turun ke jalan raya. Semangat kami masa tu really berkobar. Support dari berbagai bangsa, jentina dan umur. Kami berhimpun secara aman. Bila hampir 6:45 kami di minta beramai-ramai berjemaah maghrib di Mesjid Negara. Kami berarak secara beramai-ramai ke Mesjid sambil menyorak REFORMASI dan ALLAHUAKBAR. Keadaan di Mesjid tak ubah seperti hari Jumaat. Selepas solat maghrib kami bertahlil beramai-ramai. Kemudian kami keluar mesjid sambil bertakbir. Perjalanan ke Dataran Merdeka diiringi dengan takbir,nyanyian lagu Barisan Kita dan laungan REFORMASI. Jalan dihadapan Bgn SA Samad ditutup kepada lalulintas. Kami memenuhi hadapan Bgn SA Samad sambil duduk. Laungan REFORMASI dan takbir sentiasa berkumandang. FRU kelihatan berbaris berhampiran Jln Tun Perak. Tiba-tiba FRU bagi warning. "Kanak-kanak dan perempuan diminta meninggalkan perhimpunan ini. Kami bagi masa 2 minit". Orang ramai bertakbir. Tiada sesiapa yang meninggalkan perhimpunan ini. Kami duduk beramai-ramai, laungan tadi bertukar kepada wirid La-ila-ha-il-lallah. Kami berwirid beramai-ramai. Tiba-tiba sekumpulan Polis di iringi FRU menghampiri kami. Wirid tadi bertambah kuat. Semasa perbincangan dibuat kami semua diam sebentar. Tak lama selepas itu, wakil kami buat pengumuman " Pihak POLIS beri kita 10 minit lagi untuk berkumpul dan selepas itu kita akan bersurai perlahan-lahan. KITA BERKUMPUL LAGI PADA 17hb OKT selepas asar"
Selepas itu kami teruskan laungan Allahuakbar dan reformasi serta nyanyian "Barisan kita". So selepas 10 minit kami terus beredar secara aman. Tiada sebarang rusuhan. Kesimpulan : Kita berhimpun secara aman. Rakyat Malaysia tidak suka keganasan. Saya agak kesal dengan amaran FRU yang terus suruh kanak-kanak dan wanita keluar, seolah-olah mereka lebih suka terus menyerang. Saya puji sikap polis yang mengutamakan perundingan terlebih dahulu. Kami tidak mahu merusuh. kami agungkan kebesaran ALLAH. KAMI MAHU KEADILAN. Waktu azan Isyak kami senyap. Warning dari FRU seolah-olah tidak mengendahkan azan. Insyaallah sesiapa yang mempunyai kesedaran dan mahukan keadilan silalah menghadirkan diri pada 17/10/98. Takbir 3x. 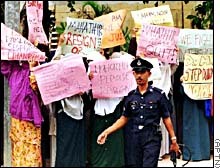 -------------------------------------------------------------------------------- Malaysian police arrest 9 at anti-government rally October 11, 1998 Web posted at: 3:25 a.m. EDT (0725 GMT) KUALA LUMPUR, Malaysia (AP) -- Police arrested nine people after thousands rallied in downtown Kuala Lumpur denouncing Prime Minister Mahathir Mohamad's 17-year rule, news reports said Sunday. A demonstration of more than 3,000 people Saturday demanding reforms and the release of arrested dissident leader Anwar Ibrahim ended peacefully after police urged protesters to disperse. But city Police Chief Kamaruddin Ali was quoted as saying by the Star newspaper Sunday that nine people were arrested Saturday for illegal assembly, including one Indonesian. On Sunday, two police helicopters circled the capital's downtown area. Many protesters had vowed that demonstrations would continue through the weekend. Mahathir fired Anwar as his deputy and finance minister on September 2, after they clashed over economic policies. 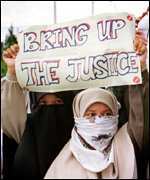 Anwar was arrested 18 days later and faces trial on charges of sexual misconduct and corruption. He has denied guilt on all charges. The trial begins November 2. Since Anwar's arrest, police have repeatedly warned against illegal political gatherings -- defined by Malaysian law as more than four people. Peaceful rallies have continued, however, drawing a cross-section of Malaysians to the streets, denouncing their current leadership, demanding the release of Anwar and the repeal the harsh Internal Security Act, under which he is detained. Saturday's street demonstration, which lasted five hours, began when about 7,000 people clogged both sides of a major shopping street in the downtown Kuala Lumpur area. The crowd later marched to the nearby National Mosque and then to Independence Square. Some minor scuffles broke out as plain clothed police mixed with the demonstrators to make arrests. Witnesses said police fired pepper spray from within the crowd and beat some protesters. After a stand-off of more than 15 minutes, and repeated requests by the police, the crowd dispersed. Anwar's case has drawn international attention. World leaders from the United States, the Philippines, Indonesia and elsewhere, expressed shock and concern after Anwar appeared in court last month with a black eye and bruises on his body, that he alleged came from police beatings. Copyright 1998 The Associated Press. All rights reserved. This material may not be published, broadcast, rewritten, or redistributed. Thousands march for Malaysian opposition figure Protesters calling for Mahathir's resignation Friday in Kuala Lumpur Lawyers demand end to tough security laws October 10, 1998 Web posted at: 8:51 a.m. EDT (1251 GMT) In this story: Wife will carry on Anwar's campaign Lawyers want repeal of security laws Related stories and sites KUALA LUMPUR, Malaysia (CNN) -- Thousands of protesters again took to the streets of the capital on Saturday to protest the 17-year rule of Prime Minister Mahathir Mohamad and voice support for former Deputy Prime Minister Anwar Ibrahim, who has been detained on charges of corruption and sexual misconduct. The protesters, shouting "Reforms, reforms," lined a three-kilometer (two-mile) stretch of a major thoroughfare. They carried hundreds of pictures of the minister and placards reading "Free Anwar" and "Long live Anwar." Some protesters openly denounced Mahathir, who accused Anwar of immorality and sacked him early last month. Anwar was arrested on September 20 under the Internal Security Act, which allows indefinite detention without trial. His arrest came after two weeks of rallies where Anwar had called for government reform. Late last month, Anwar appeared in court to face 10 counts of corruption and illegal homosexual acts. Anwar denied all the charges and said they were fabricated to silence the opposition. During Saturday's protest, some groups of anti-government demonstrators, almost entirely ethnic Malays, broke into a patriotic song traditionally sung by Malaysian soldiers going into battle. Police did not intervene, even though they had warned on Friday that no pro-Anwar protests would be allowed and that the authorities would not tolerate any show of solidarity for the former minister. 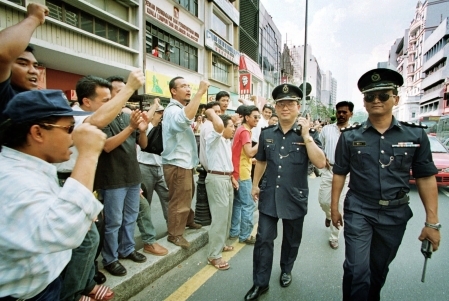 Anwar Anwar's arrest had sparked a series of almost daily anti-government protests. "Despite the warnings, the people still come here. 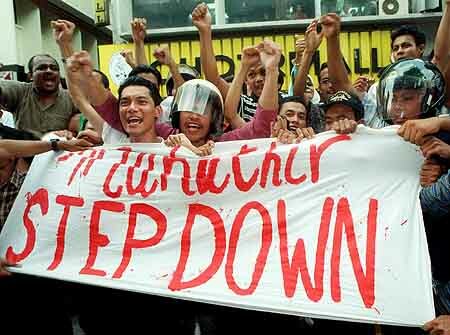 The government has lost is credibility," one protester told reporters Saturday. 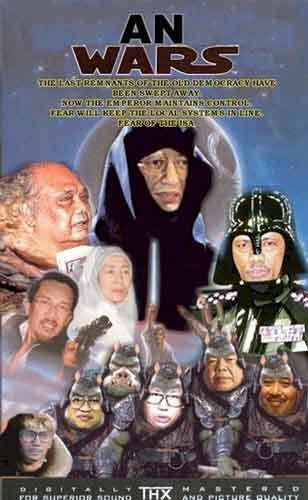 "Mahathir has run out of ideas. We can no longer accept his orders. This is a form of defiance," another participant said. Wife will carry on Anwar's campaign While Anwar is awaiting his trial -- scheduled for November 2 -- his wife has vowed to carry on her protest campaign aimed at freeing her husband. "I sometimes think about Mahatma Gandhi: when he was arrested...the movement continued. That is what I think I'm seeing now. And I believe that the reform movement is in the hearts of the people," said Azizah Ismail. Lawyers want repeal of security laws Malaysia's Bar Council on Saturday also demanded the release of Anwar as well as others detained under the tough Internal Security Act. The council, at its extraordinary general meeting in the capital, also pressed for the repeal of laws relating to detention without trial, particularly the ISA. The meeting, attended by some 2,500 of the council's 7,580 members, unanimously approved four motions which called, among other issues, for an independent inquiry into alleged police brutality and urged the police to stop harassing lawyers. Anwar had said that he was assaulted while in police custody. "This meeting is not for any personality or for any group. As far as we are concerned, it is for the rule of law, the concern for the principles that we have always held high," said council Vice President R.R. Chelvarajah. Correspondent Maria Ressa, The Associated Press and Reuters contributed to this report.